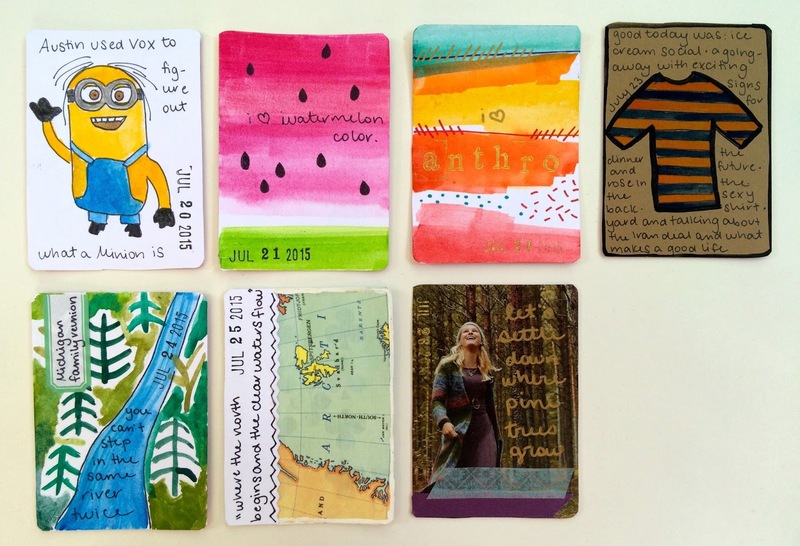 This project, like most in the art journaling/scrapbooking world, serves twin purposes. It's both a creative outlet (as I wrote about last week) and a memory-keeping device. It's challenging me to create every day in the present, and I think it'll be something cool to look back on in the future. Ideally, I like to find a creative way to express something that's going on in my day. Oftentimes, one wins out over the other - some days I'm more interested in playing around with pattern than I am in creating something deeply self-reflective - and sometimes I just don't particularly have anything to say. It's a little time capsule of our culture at the moment - a piece I'm sure I will have forgotten when I crack this album open 30 years from now. And what's more, this card captures something about us (or in this case, mostly Austin) and who we are at the moment and how we engage with that broader culture. It's a glimpse, in a neat little package, of what it's like to live in DC and spend too much time on Twitter and look to certain authorities on all manner of questions, from the Greek crisis to popular culture. And it's something that will hopefully make me laugh as hard 30 years from now as it did then.